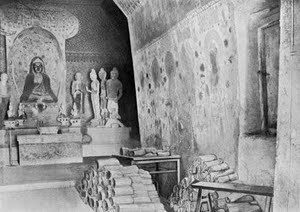 In his classic travelogue The Ruins of Desert Cathay, the archaeo-adventurer Aurel Stein describes his first visit to Tun-huang (Dunhuang) in 1908, lured by stories of cartloads of ancient Buddhist manuscripts hidden away in secret niches in the sacred “Caves of A Thousand Buddhas”. 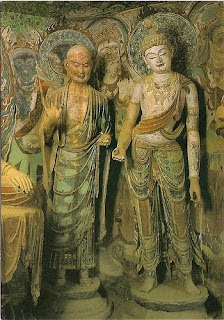 This richly decorated shrine was carved out of the low hillsides amidst a freezing, windswept desert along one of the most inhospitable stretches of the famed Silk Road. One thousand years ago, this desolate country – the topography of which is as central to this novel as anything – boasted two particularly significant aspects. For one, it lay along the main east-west trade route connecting the great civilizations of East and West, and for another it was in close proximity to the steppe region in which the prized thoroughbred horses of Liang-chou, essential to the Asian cavalries, were bred. It was for these reasons that the area was of importance to the Sung Empire of China, and it was in the potential for glory and riches that the ethnic peoples of the region engaged in seemingly endless wars for autonomy and vassalage. It is by the most accidental of circumstances that Inoue’s protagonist, Hsing-te, comes to the inhospitable lands of extreme western China. An educated young man, he has but one more interview to go in China’s infamous examination hell to complete in order to enter into a highly desirable civil service career. He is confident of his success, having passed all previous examinations brilliantly, but on this day, fate intervenes. He dozes off under the courtyard elms as he waits for his name to be called and dreams of a meeting with the Emperor, who quizzes him on the best means of subduing the upstart peoples of the Central Asian steppes. By the time he awakens, the courtyard is empty, and the interviews are complete. He has lost his opportunity to sit for the coveted Palace Examination. He wanders despondently through the town, until his attention is caught by a spectacle at the marketplace: a barbarian from the west has an exotic woman, a naked His-hsia, whom he is selling. He is, however, selling her piecemeal, and as the crowd watches, he severs two of her fingertips to prove the seriousness of his proposal. Hsing-te is intrigued by the woman, with her dark and vaguely Caucasian appearance and intense stoicism. He purchases her. She is leery of his intentions, but when he assures her that she is free to go, she leaves him with the only real possession she has, a strip of silk with strange, undecipherable writing on it. It is, she tells him, the newly conceived script of the His-hsia. It is the combined effect of this remarkable woman (whom he never sees again, but whose numerous avatars he sees in the mud-brick towns of the His-hsia) and the strange script that pulls him to a new life among the warring peoples of the Inner Asian desert. I shall not enumerate Hsing-te’s adventures in detail. A not particularly adept soldier, he survives, with his new commander Wang-li, waves of brutal battles on the steppes as part of the mercenary Chinese vanguard in service to the His-hsia. As they take one particular town, Hsing-te discovers a woman hiding in an unsearched watchtower. He is awed by her regal beauty, and seeks to protect her from the ravaging troops by sequestering her in a storeroom, where he visits her and nourishes her, and where, overwhelmed by her beauty, he aggressively makes love to her. Hsing-te’s facility with words and language lead to his reassignment to a distant city in order that he may learn the language of the His-hsia and compile a useful Chinese/His-hsia dictionary. He is suited to the task, but his reassignment requires that he reveal the woman to Wang-li, placing her under his protection. The woman, who is in fact a Uighur princess, has but a brief role in the narrative, but she is the Helen figure which binds four men and leads not only to a civil war in Central Asia but the preservation of one of the world’s great cultural treasures. It is a strange matter of fate that Yasushi Inoue, the Japanese author of Tun-Huang, did not visit the Central Asian locale of his adventurous tale until almost 20 years after the 1959 publication of his novel, and even then he did not have the opportunity to visit the caves themselves. 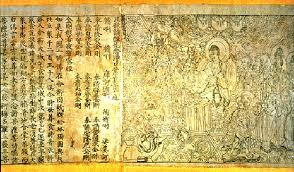 His story was born of his curiosity as to how the priceless manuscripts came to be sequestered and hidden for centuries in the Thousand Buddha Caves, how there are stories in history that we cannot know, and which we must fabricate to the best of our abilities given stark historical facts, the vagaries of human nature, and the inventiveness of the human imagination. Inoue’s fabrication is as good as fact, for it rings true in its epic scope and its fine characterizations and motivations. It is a story that takes to a distant place and time outside of ourselves, that gives flesh to the bones of history, and passion to the shades of the nameless dead.